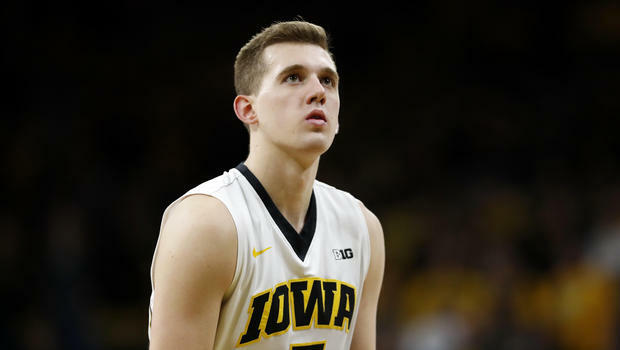 Blog "That's Not My Record to Have"
Jordan Bohannon, is a shooting guard at the University of Iowa. He is a good one too. He shoots with incredible accuracy. This weekend he stood at the free throw line with 34 straight makes to his credit. He pointed to the sky and shot the ball. Jordan missed… intentionally. Why? Twenty five years ago, Chris Street was a pretty good shooter at the University of Iowa. In fact, he also made 34 straight free throws. However, Chris never got a chance to try for a 35th free throw. Chris was tragically killed in a car crash during his junior year. Joe’s Perspective: They say records are made to be broken. I mostly agree. We all do. However, there is an exception to every rule. Jordan proved that this weekend. I don’t know Jordan, but this was a class act. He earned the respect and the accolades because he provided a high-character move. I know the Iowa family appreciates this act of kindness. I know the Street family appreciates it too. Congratulations to this young man who chose appreciation over records. Your Turn: What is your opinion of Jordan Bohannon, and his choice to miss this free throw? I think he is a special kid. Not everyone would have done what he did. He didn’t want the record or the fame because he knew it mean something bigger. There was something bigger than himself in the message he portrayed by not breaking the record. He didn’t care to be known as a great shooter or anything like that but it was clear that character and humility were more important. I think it’s great that he did that. Not a lot of people think about anyone else’s legacy but their own. It’s great that he thought of Chris’ legacy and keeping it alive. I believe it’s truly inspiring what he did not only for Chris but for Chris’s family. Now Chris’s family will still have the presence of his legacy around. He didn’t care that he didn’t get the title he only cared about keeping Chris’s legacy alive, proving traits of an excellent role model and good character. For someone to give up a record like that is truly extraordinary. It’s not everyday you see a college player willing to give up a record for 35 free throws in a row. I think Jordan left an even bigger and more positive impact because he missed the free throw on purpose. This act of character is something we should all look up to and it should be taken note of. This is very touching and inspiring for all that’s involved with Chris, He did this to prove who he was and he proved that he was a man of character and a man who cares. We should all take this into account and do something like Chris. For a college player to just give up a record in honor for another ball player is extraordinary. I believe that he did the right thing and gave an awesome tribute to Chris. Character played a big role in this decision because the record could have easily been his but he chose to honor his fellow teammate. I think that was an awesome story. It was very big of Jordan to care more about someone who didn’t get the chance to break a record than himself. Most professional basketball players these days are very selfish and they only care about their own fame and fortune. Jordan proved that he was just the opposite of that. He gained lots of respect from his school and community just by one simple act. He showed that he has great character and deserves the respect that he is now given. It was an act of selflessness and sacrifice from a truly inspiring individual. Giving up the record to honor he prior was something we can all take something from. He sacrificed his chance to leave a legacy in setting a new record . This was an inspirational choice that Jordan made to honor Chris’s life and legacy. In doing so, he left an even bigger mark on the lives of those around him, though this was not his original intention. Giving up an opportunity of a record like that shows he is truly a sacrificial person. Many people are so focused on themselves and the fame they achieve for records they set or standards they reach. To him, Chris’s legacy and name associated with the record was more important than himself having the title. He knew he was fortunate enough to get there and Chris, unfortunately, was not. He left a very important message and impact that showed amazing character. I think it was the honorable thing to do, he had the chance to break the record and he missed the shot on intentionally out of respect for Chris Street. He could have made the shot and went on with life but instead he honored Chris and the fact that he never had his chance at the 35th free throw. This is definitely an example that many people should fallow. I think that its great that some would be willing to give up to give up a record the who know how long it could last for. What Jordan is truly inspiring. Jordan probably made more of a impact missing that free throw that if he would have shot and made it. This story shows a great representation of sacrifice. I do not know of many people who would have done that. This just proves that there is still some good in the youth of our nation. Not only did he prove others that it is not his record but he paid his respect to Chris while doing so. I think it was incredible for him to give up his record in honor of Chris. If athletes get the chance for a record, they take it. By him doing this, he showed strong character by keeping Chris there still. I think Jordan is an incredibly respectable person for what he did. Not as many people would have been able to push aside their pride to keep alive a memory and an honor of another person who set the record before him. It was definitely a bold move on his part. For this guy at such a young age make this sacrifice, he now will mark his place in the history books with Iowa for this act. Most college basketball players are trying to get to the league and are showing their talent. However this is not the case with Jordan, He knew what it meant to be a Iowa Hawkeye and that it wasn’t all about him. I think that was the best thing to do than being selfish and having the record to yourself. He knew that it wasn’t his record to have, and he respected Chris and let him have the record. I think it was very thoughtful and selfless of him to intentionally pass up the opportunity to break a record for somebody that he’d never even met. Ironically, by throwing away his chance at making a new record, I believe that he made an even bigger impression and legacy than if he’d made the shot. Hopefully others will be able to follow his example in the future. I think that missing the free throw was the respectful thing to do. I am impressed that a college basketball player who didn’t even know the current record holder would even think to do something like this. A lot of players only focus on themselves and their stats in order to make it to the next level or be recognized. i think it was a very respectful and a hard thing to do because who knows how long it may be until he or someone else reaches 34 shots and has the last one to make it to 35. my opinion of jordan would be that he is a very inspiring and respectful student and basketball player for risking that shot and missing it. I believe that Jordan Bohannon purposely missing a record in order to honor someone who deserves to keep that record truly shows his character and the kind of person that he is. He says, “it just wasn’t my record to have,” he knew it wasn’t right to break the record, he let Chris Streets’ legacy live on. This inspiring story deserves to be heard, and many should look to Jordan as a role model, it takes a person of high character to do something like this. This shows great Sacrifice and respect. He did not think of him self he thought of others, he chose to give up a being a record holder. I think that it was the right thing to do. I think he would’ve felt guilty if he went for it the rest of his life. This was a bug sacrifice for him. It was hard for him to do, but he knew that Chris deserved to hold the record. He was selfless, and I am shocked by that. I would have thought he would want to make it because he probably wants to be noticed by the record. What is your opinion of Jordan Bohannon, and his choice to miss this free throw? I have a lot of respect for Jordan and his decision to miss the free throw for his friend. I know that a lot of people would chose to break the record and that’s not a bad thing, but it shows a lot about Jordan’s character. For someone to give up a record is amazing. That record has been set in for a long time and would have been even longer if Jordan broke it. You do not see a college player giving up a historic record that it is very hard to achieve. I think this is really big of Jordan to care about someone who didn’t get a chance to beat the record. Not many people would give something like that up for a person they care about. He gave up a spot in history to do what he thought was right. He knew Chris was never given the opportunity to continue his record, and that the right thing to do was to let him keep the record. He showed that the record didn’t matter to him and chose to honor Chris. It takes a lot to give up the chance at a record like that and it’s not everyday you see someone give up something like that for someone else, and a chance to get remembered. What he did showed how much respect and character someone can have to show other people. I’ll do the same and that’s really respectful of Jordan to do and I know he gain a lot of fans for his decision making during that game. For someone to die in a car crash is tragic so why not leave something he did in his name that he achieved. I think what he did was right. That kid probably would have kept going, but he sadly never got the chance to do so. It is a great way to show respect toanother man and leave his name for people to rember in future generations. Jordan made an enormous sacrifice. He had the choice to make that free throw but didn’t because he didn’t feel like it was right to take that record away from Chris. I think Jordan deserves a whole lot of respect for this kind act that he did because not a lot of people would miss that on purpose. I think Chris made a great hard decision to remember someones great legacy they had. I think he did what was right, he understood it wasnt his record to have. He avoiding to get the record showed he didnt care about his own legacy which many people cant do. For someone to give up a record like that is truly amazing. I am surprised that a college basketball player who didn’t know the current record holder would even think to do something like this. He has gained lots of respect from his school and from his community just by what he did. This story shows a great representation of sacrifice. I can honestly say I don’t know a lot of people who would do this without being told to. It is very hard to give something like that up but it was definitely the right thing for him to do. Jordan knowing and having respect for Chris’ record shows great character and attitude. Jordan was confident and didn’t doubt himself to miss his 35th free throw on purpose to show respect for Chris’ record of 34 straight free throws made. Jordan knew what he wanted to do and it surely made an impact on his name.